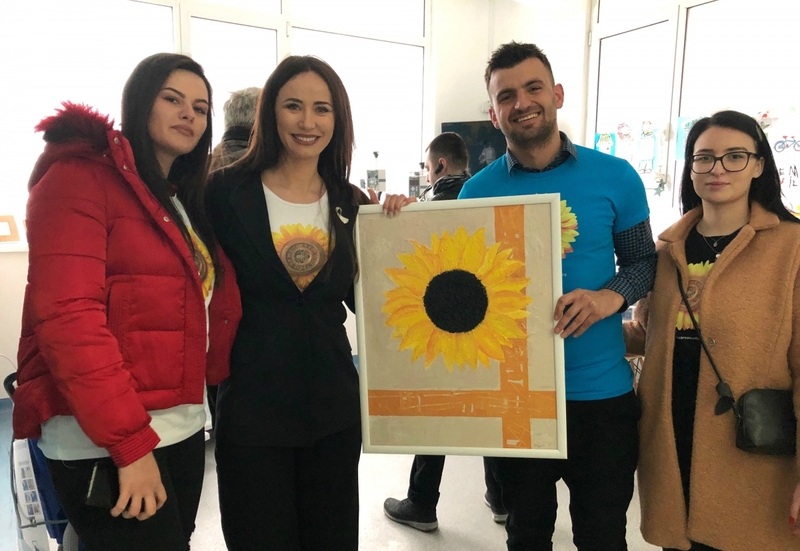 A delegation of the Student Parliament of the University of Tetova, led by President Islam Imeri, today attended the closing of the humanitarian campaign “You are a sunflower”, which was held at the University Clinic for Children’s Diseases in Skopje. This humanitarian action was set up at the initiative of journalist Albana Osmani and was initially focused in Tirana and Prishtina, and months later, she decided to expand her initiative in Macedonia as well. The University of Tetova was one of the many institutions that joined this campaign. The president of the Student Parliament of the University of Tetova, Islam Imeri, said that he and his team joined this humanitarian campaign from the beginning. The mission of this activity is to restore the smile of every sick child. “Today we were present at a very important humanitarian event, such as the closing of the campaign “You are a sunflower” headed by Albana Osmani. For us students, it has been a great pleasure and a special motive to join this campaign, as we all know this foundation is intended to help every child suffering from blood diseases in the hematology/oncology unit in Skopje. I would like to thank the Rector of the University of Tetova, Prof. Dr. Vullnet Ameti for his support in this regard, as well as every student and professor who supported us during the campaign, buying the shirt with the logo “You are a sunflower”. Also special thanks to Miss Albana Osmani for her extraordinary work in support of all children in our country and beyond” said the president of the Student Parliament of the University of Tetova, Islam Imeri. At the end of this campaign, where many personalities from the country and leaders of the institutions were present, the Foundation “You are a Sunflower” awarded letters of appreciation to the University of Tetova and the Student Parliament, while the president of the Student Parliament, Islam Imeri, granted a picture with a sunflower to Miss Albana Osmani in sign of gratitude for her contribution.